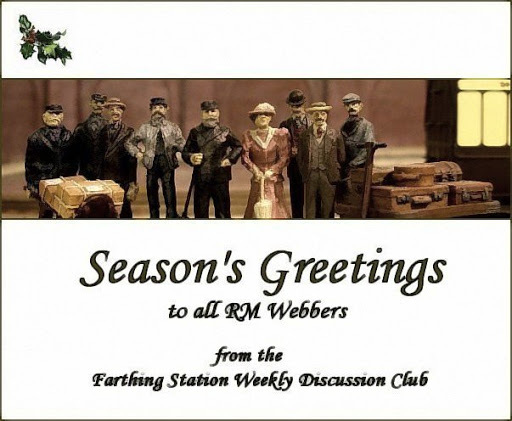 After a slight delay (no doubt caused by the villainous LSWR and MSWJR) the christmas mail has arrived. Merry christmas and a happy new year everyone! Your posts this year have been an inspiration to me so thank you. as missy says, have really appreciated your blog this year. Mikkel.Compliments of the season.Looking forward to seeing further progress.Hoping to make some myself. Thanks everyone, also for all your kind comments and inspiration . as others have said 'truly inspirational' both in concept and narrative. In particular the narratives are a reminder that the 'real thing' wasn't built to be copied by us,it was built to provide a (profitable) service to the community (something todays Train Operating Companies appear to have lost sight of - I should know, I work in an industry-related field) . Whilst it is difficult to create on what is essentially static scenics, consideration of this element provides an added sense of realism - so evident in your work! Will: Yes, those moustaches are from the days when a man was a man . The longer ones are little peels/shards of whitemetal, which has the advtange that they can be tweaked to shape after being glued on. Ian: Many thanks, you state the intention of the narratives and figures better than I could. That said, I suppose it's all a bit of a balance, as it wouldn't be good if the figures take over too much. I'm a firm believer that there should be some degree of operational interest on layouts (within the necessary limitations of a micro).